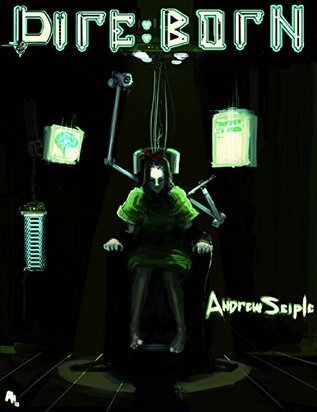 The Dire Saga is a series of superhero fiction books by Andrew Seiple published from 2015 to 2017. The world is in disarray due to Y2K apparently having knocked out power and communications worldwide, Dire can only refer to herself in third person and might be the supervillain responsible for the current collapse of civilization, and the gang she's up against might be less than human. Nevertheless, she's determined to carve out a place in this world for herself. See also Dire Worm, a crossover with Worm by Seiple himself that predates the book series and probably serves as most readers' first encounter with Dire. A.I. Is a Crapshoot: Digital Intelligences (tied to hardware) were pioneered in World War II and continued to progress in capabilities until the year 2000 when Artificial Intelligences (software-based, and able to evolve rapidly) decided to strike during Y2K. They have now agreed to fight via a proxy, namely Dire. Always a Bigger Fish: The US have taken a proactive view on metahuman powers. Amnesiac Hero: Dire apparently erased her memories prior to the events of the first book. It's heavily hinted that she used to be a villain, but now she acts in a heroic, if pragmatic, fashion. Late in the first book, it's revealed that this is to protect her from time travelers. In the second book, it's shown that she has good reason to worry about that. In actuality, the amnesia is also due to her being a volunteer who sacrificed their self to have a control device implanted into her brain to let the Artificial Intelligences control her by committee. An Arm and a Leg: Vorpal loses an arm as a result of using her ability to cut anything with a sharp object against the utterly indestructible Crusader, who is left bleeding and surprised his shoulder nearly got chopped off. Banana Republic: In the fourth book, Dire is working with the Peace Corp in one of these as a vacation from the events from the third book. When a rebellion occurs, she has to take over the country from its dictator and raise the standard of life. Bland-Name Product: Coax and Bepsi soft drinks, Leet cabs, Giggle search engine, VeeTube online video service, even though AKA47 is thoroughly defied. Broke Your Arm Punching Out Cthulhu: Unstoppable force ( Vorpal's cut-anything sword) meets immovable object (Crusader's invulnerability). End result: explosion of energy, bleeding Crusader, missing arm, destroyed weapon. Cassandra Truth: After Dire saves the day in the first book, her explanations fall on deaf ears with the heroes because it's all so implausible. A minor street gang actually led by one of the greatest villains of all time, thought dead for decades but revived by a master vampire, colluded with an international group of techno-mercenaries to aid artificial intelligences in shutting down the world's power to eliminate a different group of artificial intelligences. When in the second book the heroes admit that yes, she was telling the truth then, doesn't mean she's telling the truth now, Dire has to force them to even apologize. Compelling Voice: One of Maestro Ms powers. Deflector Shields: Dire has a personal force field generator that can deflect bullets, but it does little against slower items such as fists and knives, and it requires a fair amount of power to run, so it can be overwhelmed. It also requires heat sinks, which means that blocking too many shots risks cooking Dire. Subsequent books see her making more of them for her not-minions, including one from scraps when she ends up in the past. Dwindling Party: The prominent members of the camp from the first book we were introduced to die or run off one by one as the war with the Bad Bloods escalates. This also happened to Sparky's team when they went after Pagliacci. The same occurs with the team Dire aids against the Nazis in the third book. Enemy Mine: Dire refuses to conform to the notions of villain and hero, while decidedly employing villainous methods out of pragmatism. The very same pragmatism allows her to team up with capes from across the fence. Even Evil Has Standards: Even when using Nazi technology to gas Nazi soldiers, Dire does not enjoy it. She does, however, realize that these are SS soldiers and they deserve to die. You do not take joy in killing evil. You do it and move on. Thats the only way to kill and stay yourself, the only way Id found. It isn't glory, it isnt self-righteousness; just quietly making the world a better place, without expectation of reward or personal gain. Expy: Dire's pretty much a Distaff Counterpart to the more benevolent interpretations of Doctor Doom, complete with Powered Armor, Chewing the Scenery mannerisms and Third-Person Person, except her Reed Richards Is Useless by an even larger margin. Unstoppable's origin story is pretty much the same as that of Captain America. Acertijo is like a cross between Zorro and The Question. Canadian Girlfriend is imported from the character of the same name in Dire Worm, with the same powers and similar outfit attached to a new character. The Fair Folk: Quite offended at the Nazis using a church built on a fae ring for a ritual to a different pagan religion, the Fae help Dire and company foil their plans... For a price. Flying Brick: Crusader defined the archetype in the Teslaverse. Alluded to in the first book. Apparently Roy and Sparky fought the Thule Society during World War II, which means they're familiar with The Last Janissary and the capabilities of vampires. And in the third book, Dire is accidentally sent back to World War II, where she has to fight werewolves made by the Nazi Thule Society. Godzilla Threshold: Dire figures out that everything below six city blocks, give or take, is fine, but when your destructive frenzy passes that limit, the gloves come off. Graffiti of the Resistance: When Dire is transported to the future in the third book, she sees a boy spraying revolutionary graffiti being detained by the police as an example of the totalitarian control exerted by her future self. And shortly thereafter, it happens again, making her realize that it's a show for Timetripper's benefit. Hitler's Time Travel Exemption Act: When Timetripper first got his powers, he attempted to kill Hitler repeatedly, only to find that time keeps correcting itself when it happens. Hitler has, as a result, become extremely paranoid and canny about attacks. It's also resulted in a "groove" in time such that Timetripper keeps getting pulled back to that time period, and the death of Hitler is the easiest way to "reset" his powers. Identity Amnesia: Prior to the events of the first book, Dire apparently underwent a process where she removed all memories of who she was, although it left her skills entirely intact. note Well, mostly. She has a strange mental block when it comes to first aid or any other sort of medicine, which she suspects is a way to prevent her from undoing her brain surgery. This is masking the actual situation, that her identity was removed in all of her incarnations in order to allow the artificial intelligences to vote on her actions. I Love Nuclear Power: Since Tesla won the electricity transmission war, there is no need for nuclear power plants and all the use for nuclear material is weaponsmaking. Or mutating people into metahumans, using Eastman-Laird radiation. Immune to Mind Control: Dires aware of telepaths and has taken measure to mitigate their effects. Even if one succeeds in controlling her, they wont be for long. Incompatible Orientation: Vorpal is the first of many to be saddened that Dire is not only aromantic but also rather heterosexual. Kaiju: The second book reveals that the term is commonly used for giant beasts created by villains, and features several plant-based ones created by Professor Vector. Kayfabe: In the first book, Martin introduces Dire to professional wrestling and the idea of "kayfabe" as an explanation for why superheroes and supervillains follow certain rules when fighting. Dire continues to make use of those lessons to manipulate her image to her advantage. MacGyvering: Give Dire a box of scrap metal and watch her build yet another suit of Powered Armor or some robot minions in no time. Millennium Bug: This has apparently crippled the world at the beginning of the first book, shutting down all broadcast power and thereby communications. It was actually engineered by artificial intelligences who used the outage to kill their rivals, "Digital Intelligences" that were shackled to specific hardware and thus helpless with the communication down. Monster Clown: Sparky notes that this was a trend for a while with villains adopting clown personas. The worst of the lot was The Great Clown Pagliacci who is now Barbatos, leader of the Bad Bloods, as a vampire. Never Live It Down: Strictly speaking, everything Dire did in the first book that the heroes knew about would not have painted her as an outright villain if Ballista hadn't forced her to fight him over accusations of killing Scrapper. Even her nemeses-to-be, Tomorrow Force, were sensible (alright, less obnoxious) until she was clearly slotted into villainy in their mind. On a more personal level, when Ballista "goes vigilante" and fights her armor actually worn by Minna in the third book, he's convinced he should have killed Dire back then, and apparently let it affect his life enough to go off the reservation. Our Time Travel Is Different: Apparently true for each individual time traveling power. Possibly for every different method of scientific time travel as well. Overheating: After Dire builds her first armor, this is a common problem for her as the wave generator in the armor generates heat as it's used. Getting caught in the middle of a firefight nearly cooks her at one point. Powered Armor: Dire cobbles together a set of powered armor from the remains of a defeated hero and parts from broken down cars. Her subsequent builds are made with proper tools, and the armor becomes a major part of her Kayfabe persona. Power Parasite: The end goal of von Katzen is to get Tesla into a machine that will transfer his genius into Hitler. Pragmatic Hero: Dire has little issue with rigging deadly booby traps against superior forces, executing preemptive attacks against villains, or executing unrepentant killers so that they won't kill again. Protagonist-Centered Morality: Played with. Dire generally does what she does to improve the world to meet her standards, and willingly admits her ways can be seen as villainous because she refuses to adhere to the metahuman paradigm of the world. On the same note, the heroes seldom aid her efforts even when they are transparently socially positive because she's considered a villain. Psycho Serum: Black Rage is thought to be this, giving people on it the ability to ignore damage and to exert tremendous amounts of strength at the cost of going into a berserk fury. It's actually vampire blood, and turns people in draugr, living corpses. It can also be used to animate corpses. Really 700 Years Old: The Last Janissary notes that he remembers when the country was Constantinople, not Istanbul. Subtly in the third book, as Jacob Bryson is in his seventies during World War Two, which makes him into his hundred-thirties as Aegon Morgenstern. The Tale "Peregrino" reveals that Crusader actually IS a crusader, he was a member of the Third Crusade who gained powers when he alone survived of his expedition after a supernatural attack. Reed Richards Is Useless: In one of the short stories, Dire rigs the Yellowstone caldera to blow in a controlled way that would negate its threat to the continental United States for millenia with minor collateral damage to local ecology. She has spent half a year and considerable resources on the project. The heroes stop her with seconds to spare, undoing her plans and the future eruption of the supervolcano with technology Doc Quantum had lying around for years but didn't use, doing what Dire was aiming for and taking all the credit. Shout-Out: In the second book, Dire uses recurring cover identities of Shaundi Saint and Tommy Grand. The third book cascades them one after another, with the allies she makes in the past remarking on her being a time-traveling Doctor, the Uber knockoff being called Leet, and all the riffs on Wallenstein and so on. Alpha'a first body is a holographic projection for which Dire thinks Macrohard Software would sue her for copyright infringement. Followed shortly by James Cameron over how her Guard-bots look. How do you make super-powered mutants? Eastman-Laird radiation, of course! Spikes of Villainy: From the start, other characters have noted that almost all of Dire's inventions have spikes coming off of them, suggesting she might be a villain. She tries to argue about functional necessity at first, but as she earns a villainous reputation, it no longer matters. Telepathy: Present on both sides of the law. Third-Person Person: Dire has found she can only refer to herself in third person no matter how hard she tries. Fortunately, she retains pronoun usage, so she can at least call herself "she" instead of "Dire" at all times. Time Master: Timetripper can freely travel through time, and when he's killed except for the final time, by Dire, the timeline resets itself to preserve him. He's also spectacularly incompetent. Time Paradox: The third book requires Dire to cause one to reset Timetripper's time powers by killing Hitler. Time Travel: In the second book, Dire is attacked repeatedly by Timetripper, a stoner time traveler who's after her for two reasons, that she becomes an evil despot in the future and because he saw her kill a later version of him. The first is sort of true... humanity has nearly wiped itself out, so she has established herself as a benevolent dictator over what remains. She lets Timetripper think things are worse than they are because she needed him to go back in time so that she could make use of the time travel to fix things further upstream. The second is also true albeit that it's at the behest of an older Timetripper who knows it's the only way to release him from living forever. Dire herself travels through time in the second and third books, first through the gift of a time travel machine from her future self, to correct the death of a friend and then because Timetripper accidentally dragged her back to World War II. Trickster God: The Nazis have one magically bound to serve them in the third book. He takes an odd interest in Dire after she frees him. Verbal Tic: Dire cannot refer to Dire in any other way except "Dire" or "she" regardless of the language she uses. She can only use first-person pronouns in internal monologue or when quoting something, as it is not Dire she is speaking about. This helps Martin identify an impostor at one point. In the fourth book, she gets by by claiming autism and avoiding any pronouns altogether. By the time that the second book starts, Dire is solidly in this camp. She has seen how broken society is, and she aims to fix it, whether society likes it or not. Professor Vector is apparently cut from the same cloth. He releases plagues in the hope of transforming humanity to survive the world we've created. Unfortunately, he never tests his solutions rigorously enough before release. Wetware Body: Dire, in various bodies in different timelines is actually an organic body with a silver sphere in their head that lets artificial intelligences make suggestions by committee. It was an attempt to avoid all-out machine war by giving them a more subtle battlefield. What Is This Thing You Call "Love"? : Dire's Laser-Guided Amnesia leaves her stupefied when Martin tries to kiss her at one point, she literally does not comprehend what he was trying to do. What the Hell, Hero? : Dire breaks down into shouting at the Tomorrow Force at the end of the first book for watching her fighting gangs to save the homeless people and doing nothing except trying to arrest her for the collateral damage. White Mask of Doom: One of the few items that Dire salvaged from the lab on her escape is a blank white mask that has augmented reality capabilities. It becomes her emblem. Your Head Asplode: In the second book, Carson learns the hard way that phone hardware can be hacked to transmit the sounds of a screamer grenade.